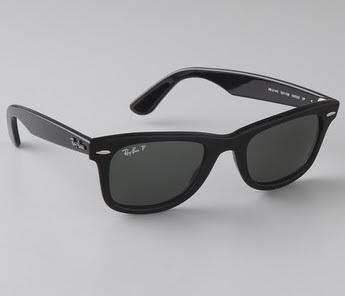 Ray-Ban Wayfarers are a ubiquitous favourite among celebrities, hipsters and coveteurs of classic cool for a reason. The frames flatter a variety of face shapes; they look as good on Anna Wintour as they do on Joseph Gordon Levitt. And at $150-200 a pair, unlike high-end designer shades, they won't break the bank. Or will they? After all, the definition of what breaks the bank is relative. If you're on a student budget or notoriously careless with shades, spending that much on a single pair may not be feasible. Luckily for the budget-conscious, knockoffs abound. For the girly spirit, Urban Outfitters has these pink pearlized Sahara Wayfarer shades ($14). They even come with rose-tinted lenses. 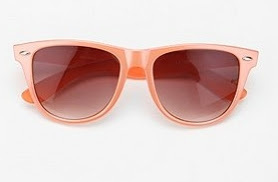 And for a quirky modern twist, the Meridian sunglasses ($24) from Anthropologie fit the bill nicely. 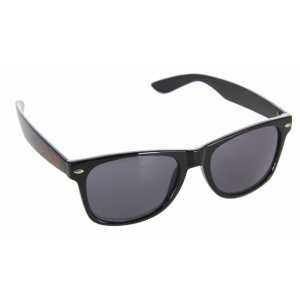 Would you wear Wayfarers or Wayfarer lookalikes? The green ones are wicked! 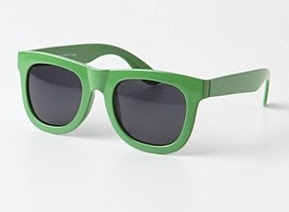 I just discovered that wayfarers actually look good on me and I think I want a real pair. I am not too keen on wannabe's because I can totally tell the difference with the quality of lenses. I hope that doesn't make me sound snobbish. I find that if I buy expensive sunglasses, I take very good care of them. Leesh, not snobbish at all! I have Chanel sunnies and real Wayfarers and the lenses in those are definitely superior to fast fashion shades. Whenever I wear them, the world looks more true to life in terms of colour, there's minimal glare and the clarity is amazing.